Peter J. Limone spent 33 years in prison for a murder he didn’t commit, then became a local legend after winning his freedom and a $101.7 million judgment against the FBI for framing him and three other men. A fighter to the end, Mr. Limone, 83, died Monday after a five-year battle with cancer. Mr. Limone was raised in Boston’s West End and lived much of his life in Medford. He was only in his 30s when he was sent to prison, leaving his wife, Olympia, to raise their four young children alone. By his own account, the years he spent behind bars were difficult. US District Judge Nancy Gertner found the FBI deliberately withheld evidence that Mr. Limone, Joseph Salvati, Louis Greco, and Henry Tameleo were innocent, then covered up the injustice for decades as the men grew old behind bars, and Greco and Tameleo died. The discovery of secret FBI files that were never turned over during the men’s 1968 trial prompted a state judge to overturn Mr. Limone’s conviction in 2001 and set him free. The documents showed the FBI knew that the key witness in the case, notorious hitman Joseph “The Animal” Barboza, may have falsely implicated the four men while protecting one of Deegan’s true killers, Vincent “Jimmy” Flemmi, who was an FBI informant. At the time, the FBI had a national mandate to target La Cosa Nostra, commonly known as the Mafia. Mr. Limone was a reputed leader in the Boston mob, and Tameleo was the reputed consigliere of the New England Mafia. Initially, Mr. Limone, Greco, and Tameleo were sentenced to die in the electric chair, then their sentences were reduced to life in prison after the death penalty was abolished in Massachusetts in 1970. During the 2007 civil trial, Mr. Limone’s wife testified that she was a stay-at-home mother with children ages 1, 4, 7, and 8 when her husband was arrested for Deegan’s slaying. She sewed drapes and cleaned homes to support her family. Her children also testified, recounting frequent trips to prison, where they would be frisked before entering and frightened by the sound of heavy metal doors clanging. Mr. Limone’s share of the $101.7 million judgment awarded to the four men and their families was $26 million. After his release from prison, Mr. Limone embraced family life and loved spending time with his wife, four children, and 10 grandchildren, according to several friends. Attorney Victor Garo, who represented Salvati during the civil trial against the government, said he often bumped into Mr. Limone on weekends at a popular doughnut shop in Medford center, where Mr. Limone would frequently buy four dozen doughnuts at a time and drop them off to friends or at a local senior center. “I always saw him treat people with respect and kindness,” Garo said. Yet a year after his legal victory, Mr. Limone was back in court facing charges that he operated a ring that raked in hundreds of thousands of dollars in gambling profits. 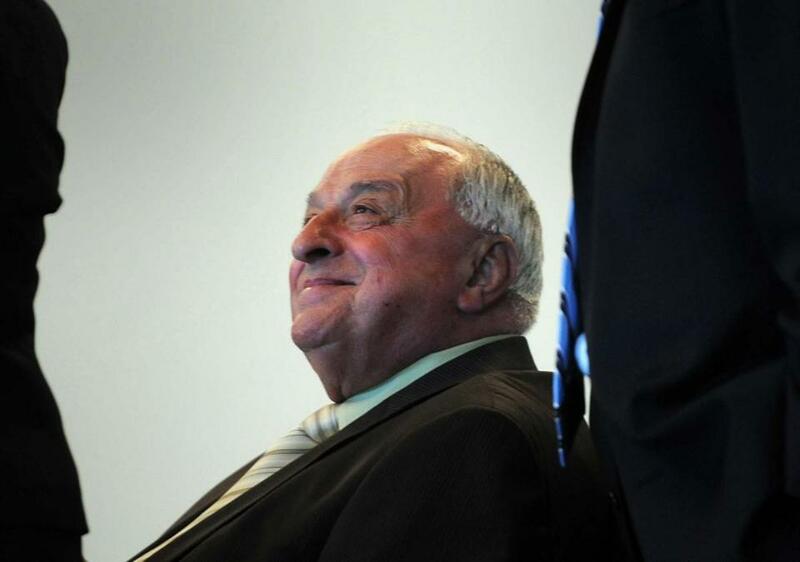 Stephen Johnson, a retired Massachusetts State Police detective lieutenant, said Mr. Limone was alleged to be the acting boss of the New England Mafia in 2008 when he and another trooper approached him at a charity event with a warrant that allowed them to search him and his Medford home for possible evidence of gambling, loan sharking, and extortion. Later, Mr. Limone pleaded no contest to state charges of extortion, organizing a gambling syndicate, and loan sharking, and was placed on probation for five years. Cardinale said Mr. Limone remained upbeat, even after spending time on death row, and was just happy to be back home with his family.